To me, the biggest joy to owning a Mercedes 380SL (or a 450SL or a 560SL) is being able to drive around with the top down. I love the feeling of the sun on me and the wind in my hair. Yes, it’s a cliche, but it would not have been written about by millions of people if it wasn’t a good feeling. In Richmond it goes up to 102 in the summer on many days, with a heat index of 110 or more. Even on days like that, I can be seen driving around with my top down. Although it’s on days like that you’ll be more likely to find me feeling like I need to blow off steam and driving on the back roads leading away from the city and into the cooler areas in the wooded regions outside of Richmond. There’s just one catch: If you’ve got the hard top on a Mercedes R107 body (which means the 280SL, 380SL, 350SL, 450SL, or 560SL), it takes at least two people to lift it off. I didn’t have anyone who could help me when it came time to finally lift the hard top off my first car of this type. I didn’t know if a hoist would damage it, so I searched the web. There was a company selling a motorized hoist for something like $850 that would lift the top up with the press of a button. There’s just one problem with that: I’m a cheapskate. I take great pride in my DIY (do-it-yourself, if you didn’t know) skills and was quite proud of myself when I found a way to easily make a working hoist for under $25. If you want to know how to take the hard top off a Mercedes R107 body, read my last blog post. I go over it in detail there, even including putting the soft top up. This entry makes the assumption you already know how to take the top off or put it on. It’s not hard and the first time I ever did it, I was able to do it by myself in less than 2 hours, including building my hoist. Still, it helps to read about how to take the top off first if you never have. Also, please note the images here are thumbnails. Click on them to see them full sized. Many times the detail is important. 3 strips of webbing. I don’t remember the length, but all were the same length with ratcheted cranks on them to adjust the length. You’ll need hooks on each end of each piece of webbing. I found webbing with hooks on each end. Rope. Make sure the rope is small enough to fit through whatever pulleys you you use but is still rated for a decent amount of weight. I always prepare for Murphy’s Law, so I allow for extra weight in something like this. One cleat to wrap the rope around. Make sure it’s big enough for the rope you pick. One screw in eyelet to hold the upper block from the ceiling/rafter/joist. The bigger, the better unless you go monster size. A small carabiner to attach to the end of the rope. Possibly you might need a metal ring to hang from the carabiner and to hook the webbing to. You may or may not need this, but it’s less than $3, so I suggest to get it if you’re not sure. It’s a real pain to get it all together and find this one piece would make a difference and you don’t have it. If you don’t need it, you can return it, but I find it’s easier to hook into than the small carabiner I found. Mounting screws or other hardware to mount the cleat to the wall. I found the webbing at Advance Auto and found everything else at Harbor Freight. I believe I looked at Lowes for the blocks and didn’t find anything other than simple pulleys that would not hold more than 50 pounds. The easiest place to start is by mounting the cleat on the wall. I had to mount mine to cinder blocks. I’m not going into it in depth here, but with a brick or cinder blocks, you may want anchors or you may want screws that are made for concrete and/or bricks. I’m no expert on this topic and whenever I have to mount anything on concrete or bricks, I always consult a friend I know with experience. Here the cleat is shown with the rope in place and I believe this was taken while the hardtop was hanging from the hoist. While you can’t easily practice this until the hoist is done, let me address this now: If you don’t know how to fasten rope to a cleat, it’s not hard and anyone who has spent time sailing can tell you how to do it. Click on the picture on the left to see how it’s done. Wrap the rope in figure eights a couple times, then instead of continuing, start another figure eight with the loose end of the rope running UNDER the rope it would normally go over. Look the picture over and practice a few times if you’ve never done it before. It helps to practice and then pull down on the hoist to be sure it can hold weight. The top block is in the left photo, the bottom block is in the right. 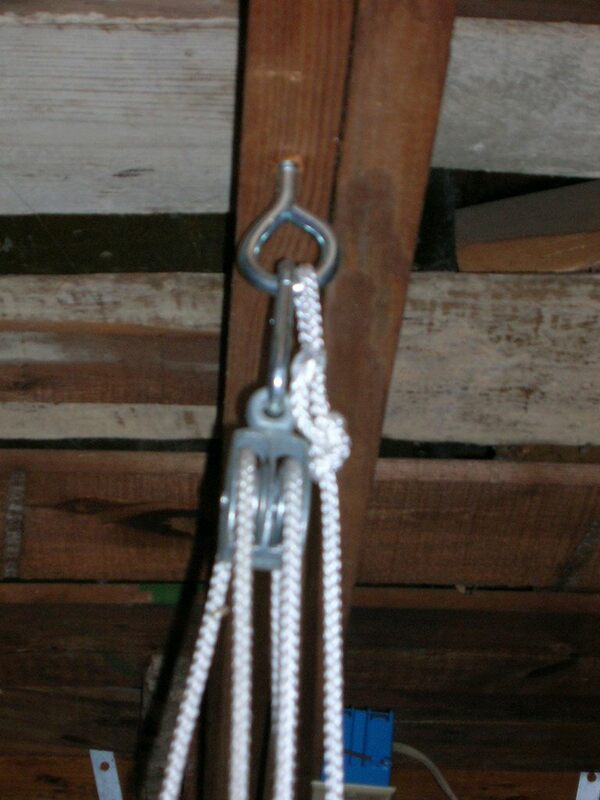 Note the the eyelet screwed into the rafter to secure the hoist to the top. I took a metal rod and ran it through the eyelet to give me leverage so I could screw it in tightly. You’re not only risking the car hard top and body, but your own safety as well. Do not take any short cuts! 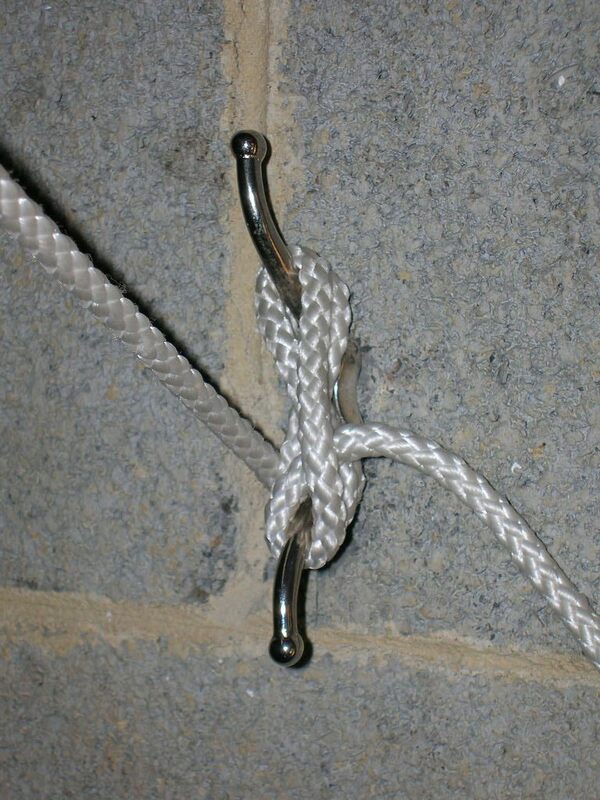 Note that one end of the rope is tied to the eyelet. If you don’t know how pulleys handle weight, or did learn in school but forgot, if you use just one pulley at the top, put the hardtop on one end of the rope and you pull on the other end, you’re pulling the entire weight of the top on your own and pulling down one foot raise the roof one foot. if you have two at the top and one at the bottom, so there are two stretches of rope running from the top to the bottom, you’ll only be lifting half the weight of the top and for each two feet you pull down, the roof goes up one foot. From here on, you can do the math, but it’s probably easy to see where I’m going: the more pulleys you have on each block, the less weight you’ll have to lift and the less each pull moves the roof. In other words, the more control you’ll have over the roof. Run the rope from the eyelet to the lower block, through one of the pulleys, back to the upper block, down to the lower one again, back to the upper one, and from there (unless one of us has lost count! ), it should be time to run what’s left to the cleat in the wall. Now pull the rope until the lower block is at a comfortable working level. Hang the carabiner off the lower block. 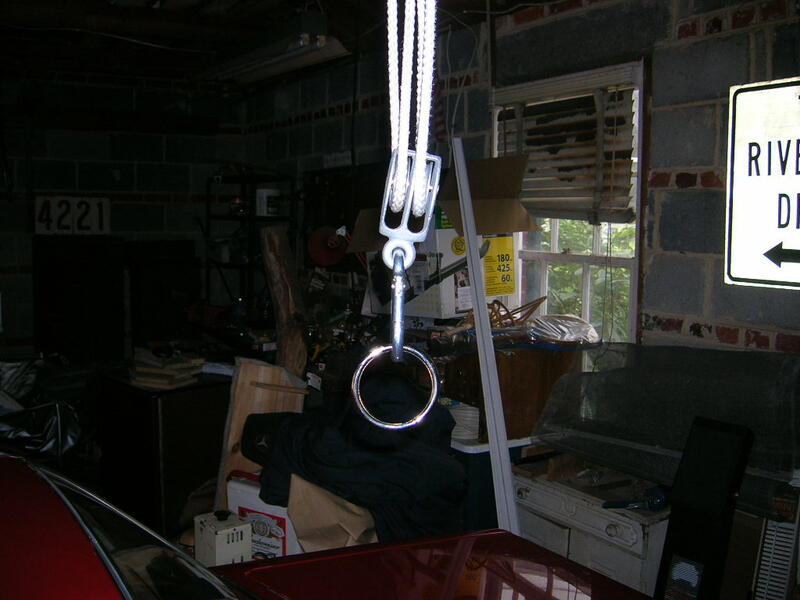 If you found a big carabiner that could hang off your block, that will probably work well, otherwise you might want to hang the round metal ring from the carabiner. Now is a good time to pull on the ring and pull on the other end of the rope and let each end move back and forth to make sure the pulleys are free and everything is working. If you don’t know how to fasten rope on a cleat, try that now, without any weight pulling on the line so you can get used to it. Make sure you know what you’re doing and can work quickly because when the roof is hanging in the air, there isn’t just the pressure of the weight pulling on the rope, but you’ll have an added emotional pressure too. You’ll want to hurt to get it done and you’ll be itchy to make sure it is working right. There’s also the added emotional stress of what happens if you drop the top by accident. I’m not trying to over dramatize it, but the major point is to make sure you’re comfortable with everything now, when nothing is riding on what you’re doing. Once you are sure the hoist is working properly, it’s time to attach the webbing. I’m sure there are other and maybe even better ways to attach webbing to the roof to hold it up, but this works well for me and usually balances it well. One advantage to using a hoist like this is that you cannot fit the webbing in place if either back catch for the hard top is still locked down or if the tang on the back is still locked down. You’ll also be forced to make sure the defroster plug is undone as you move the webbing into place. This makes sure you haven’t forgotten to take care of any of these matters. First I lock down the line on the hoist so the block won’t slip down at a bad time, then back my car into place. I lower the bottom block until it’s a comfortable distance above the car roof (a little over a foot) and tie it down. Remember to do that! You don’t want something slipping, falling, and scratching the roof! Use the two pictures in this paragraph for reference while attaching the webbing. I start by running the longest piece of webbing from the hoist ring, through one window, across the car and under the roof (staying clear of headrests), and out the other window. Then it runs back up and hooks into the same ring on the hoist. With each piece of webbing, once I got it in place the first time, I used the ratchet crank to shorten the webbing to the appropriate length, then cut off the extra webbing, since it would get in the way. The other two pieces of webbing will be shorter. It’s easier to start inside the car. On the driver’s side, hook one end of the webbing onto the long webbing going across the car. I like keeping the ratchet cranks on these pieces inside the car, where they won’t hit or scratch the paint. Run the webbing under the roof, past the catch, and slide it around to the back. The idea is to have each piece of webbing hold one side of the roof and keep it balanced. Hook this end of the webbing to the ring on the hoist, then go back inside and adjust the length with the ratchet crank. Cut off the extra. The roof doesn’t expand or shrink, so once you set the length on a piece of webbing, you won’t need to readjust it again. Do what you just did here with the last piece of webbing on the passenger side. Now check all the hooks and connections. Make sure it is all in place, then uncleat the line and make sure you’re ready. 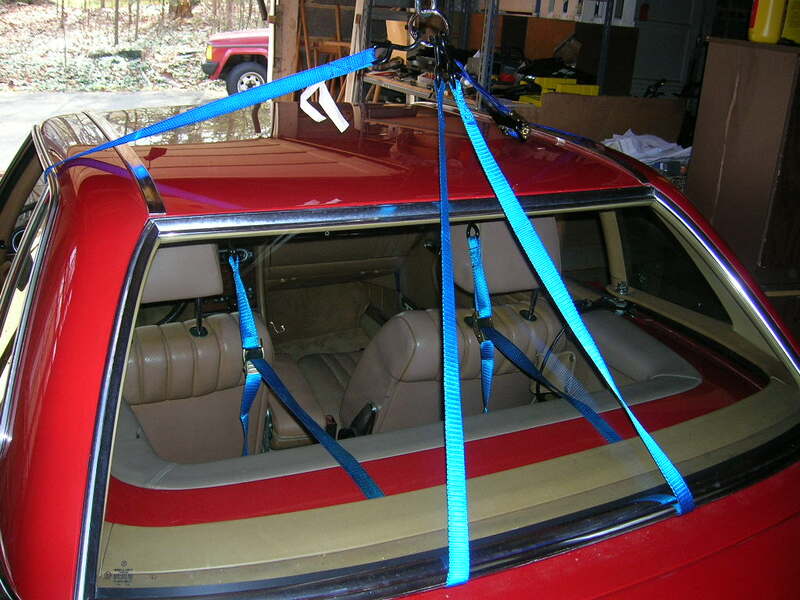 Start pulling on the rope and your hardtop will rise off the car. I find it is best to pull with one hand and guide the roof with another so you can keep it from scratching the car body until it’s clear of the car. That’s yet another good reason to use blocks with at least 2 pulleys (I would have used blocks with 3 pulleys if possible!). On mine, the rope tends to rub a bit against the sides of the blocks because of several angles and how things align, so I tend to have to pull down on one end and push the roof up as it rises. In the long run, this is a benefit, since it also gives you more control because it slows how fast the top goes down. In the photo on the left, you can see my top floating above my car. It hangs low to one side because I didn’t quite balance it well, but since it easily cleared the car and is hanging stable, it’ll work okay. Now drive the car out from under the top. I know of some people who leave the top suspended near their garage roof all summer and say it doesn’t effect the top at all. Me? I’m paranoid and don’t like leaving something like that hanging from the roof. Besides that, I got really lucky with this car. 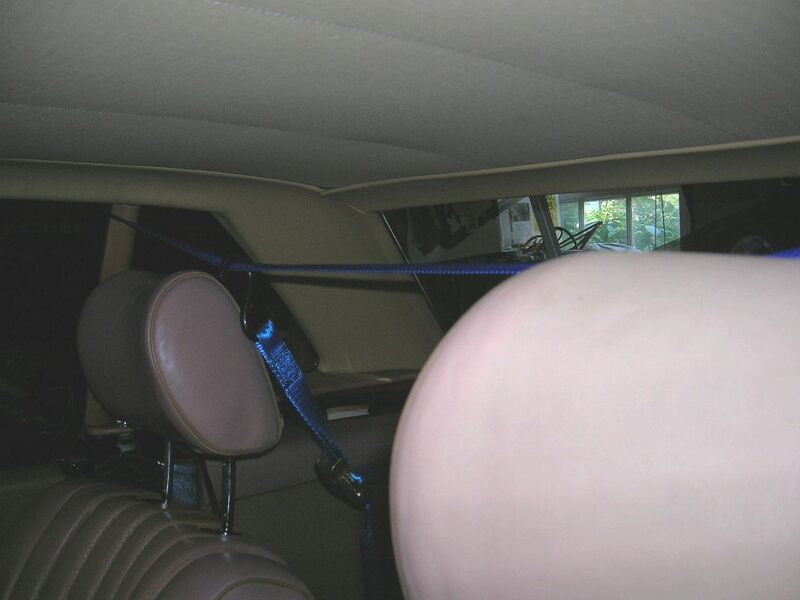 Not only is the car in excellent shape, but in the trunk was not only a rack to stand the roof up vertically for storage, but also a cover to put over it to protect it from scratching. I had to lower the roof and when it got near the bottom, move the rack into position, then use the hoist to help pull on the roof and tilt it up so it would slip right into place on the rack. Then I put the cover over it and slid the rack into place near a back wall, where it’ll safely stay until late in the fall when the weather forecast shows at least 7 days in a row with the temperature too cold for driving with the top down. An excellent pair of articles! While many can figure the whole thing out by themselves, as you and I did (I was clueless as to how to open the top well), some on the SL blog need help. One note re top removal/replacement, hard and soft; you forgot to mention (or I missed) that the smaller lever controls the tang which locks the pin. This has caused some folks problems. I purchased a hoist, used, through ebay. It consiste of a pair of blocks, (triple, and double, with becket) and a bracket, similar to a car-top carrier, or ski/kayak carrier. It clamps, securely and safely, to the rain gutters, by the rear side windows. 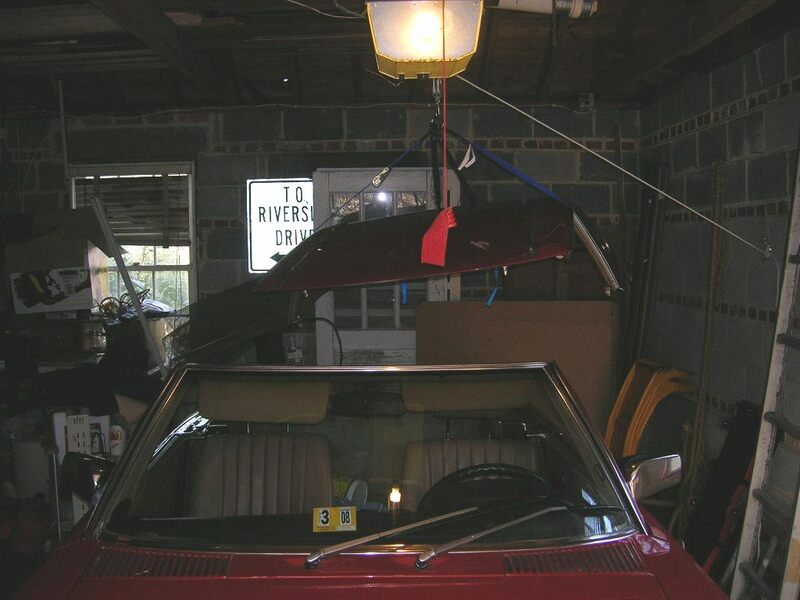 Once the car is in position, and everything released, I simply raise it to the roof, and tie the line off. There it can remain until I need it, hopefully no sooner than fall. Using webbing, as you describe, I would NOT think of storing it in that manner. The webbing runs under weatherstrip and seals, which will deform under these conditions. Use a storage rack, as you do. As for the strength and rigidity of the hard top; it is a little more than a square meter of sheet steel, with windows and headlining. It’s built by Mercedes, remember, and is a pretty solid structure. It is my feeling (without any evidence) that it would probably survive a rollover, and protect the passengers. Storing it from a roof in the manner I describe is safe; but if it is lifted by any other purchase than the gutters, use the rack. Again, thanks for the extra work and effort- a boon to the community. Thank you for some good points. I didn’t include the point about the smaller lever because, on my car, it doesn’t. I think it worked that way on my 450SL, but for some reason, on my car, the lever stays mated to the crank handle. I tried positioning them at the same angles as in my 450SL, but it didn’t work. I wonder if it’s possible the mechanism was changed over the years. If you have links to the pictures of your hoist and how you’ve set it up, let me know. I’m sure that would help those reading these posts! Thanks for your tutorial on the construction of the pulley system. The instruction with the added photos are perfect. If you weren’t a shop instruction in your past, you missed your calling. I’ve placed an on-line order at Harbor Freight for the 2 inch pulleys (very inexpensive) and will put it together when they arrive. I’m one of those sailors you describe. You can avoid the “On mine, the rope tends to rub a bit against the sides of the blocks because of several angles and how things align…” by using a swivel block. Also I would run the tail at a right angle from the main eyebolt over to a single block or eye directly above your cleat. Have you thought of using a jam-cleat? It might make it simpler to do with one hand and is a quick release. I like your idea of webbing straps! Genius! Right now I’m looking for an old used ski rack to clamp to the gutters but if I can’t find one, I’ll make one from straps as you did. I’ll get the stuff at Boater’s World nearby which they’re going out of business. Weather Man, Thanks for the info on that. I’ll have to look into it. 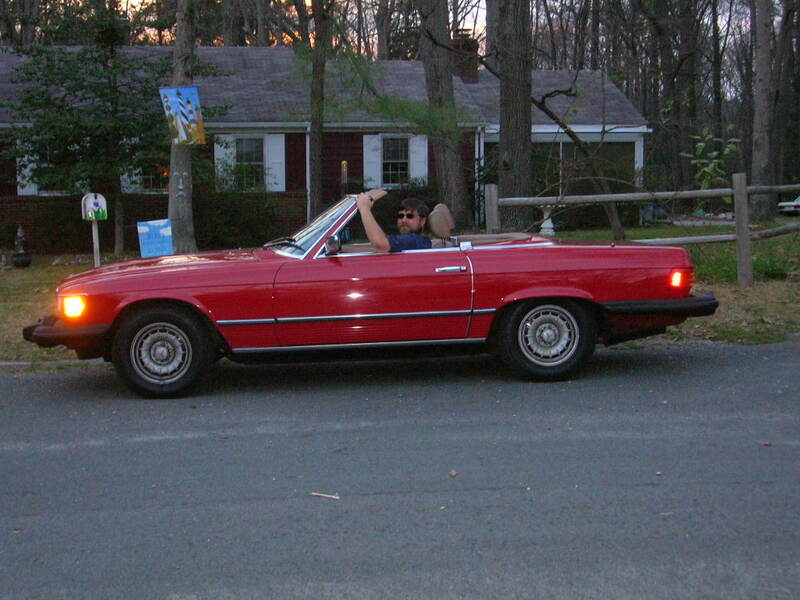 When I set it up, I just basically did a quick job so I could get the top off that evening — and was just so excited to finally be able to drive out that night, in my OWN convertible, and drive through the cool night air. I got it up and it was working — and one rule I’ve learned to follow from much grief in life is “if it ain’t broke, don’t fix it,” so once I had it working, I left it as is. But you bring up two things that are VERY simple to add, so I’ll probably go out and get the parts and fix it this fall, when it’s time to use it again. I know of someone who leaves their soft top suspended all summer long and says he’s seen no sign of warping or bending. That’d be a nice way to store it, if I could feel certain there would be no rubbing from the webbing or anything like that. Hello there! Great description and very helpful! The only thing I’m wondering about is if that single eyelet holding the block and tackle was enough to hold all the weight in a single spot. Have you ever had any issues with it? Also do you know what size you used? Chad, first, sorry for the long delay. I just found out I wasn’t getting notices when comments were being posted — and I’ve been tied down with other stuff. That eyelet is quite stable and I think it’s screwed in to a depth of 2″ or more (I don’t remember exactly), so it’s more than enough to hold the weight. Besides, the top doesn’t way but so much. The biggest issue with the top is it’s big enough that it’s impossible for one person to lift it due to balance.